Aequa by the Romans, Vico Equense or just Vico are the names given throughout the centuries to this village sitting atop a hill. Only a 10 km-drive divides Sorrento and Vico. It does not attract worldwide holidaymakers, but it is anyway a genuine gem which deserves a visit. The tourist information office is located on the main square Piazza Umberto I and provides information about the whole area surrounding it. The Chiesa dell’Annunziata is also located on Piazza Umberto I in the historic centre on Via Vescovado. In the old times it used to be the cathedral of town and is the only religious building example in Gothic style on the Sorrento peninsula. A few parts of the structure erected in the 14th century are still visible today. For instance the lateral windows close to the main altar and just some arches. The church underwent modifications in the baroque style in the 17th century for example with the incorporation of its pink and white façade. Vico’s bishops were portrayed and its pictures hung on the sacristy’s walls; however the only one which is not portrayed was the one who favoured the Parthenopean Republic at the end of 18th century and was sentenced to death because of that. An angel with his fingers on his lips symbolizing silence occupies the place his portrait should have occupied if the bishop had not supported the republican ideology. On Corso Filangieri in the Palazzo Municipale the Antiquarium Silio Italico displays an array of archaeological pieces from local tombs dating back to the 5th - 7th century BC. The museum has a timetable which is not followed as there is sometimes no staff to show you around. Therefore you will need to head for the Ufficio Anagrafico to request it to be shown to you. Off the antiquarium is the Museo Mineralogico whose collection is composed of no fewer than 5000 rock types, fossils and meteorites. The hills around Vico Equense are scattered with old hamlets called casali. As they have remained intact they provide an insight into the country life of centuries ago. A car is necessary to reach them. Via Roma and then Via Rafaelle Bosco lead to the casali. You should not miss Massaquano, the frescoes painted in the 14th century in Cappella di Santa Lucia, Moiano, where you cannot miss a walk up the peak of Monte Faito or Santa Maria del Castello’s vantage point of Positano. The Roman site of Aequa is occupied today by Marina di Equa, only 3000 metres from Vico Equense. Old an new mingle in it. Villa Pezzolo constructed in the 1st century AD, the defensive Torre di Caporivo and the vestiges of a quarry of the Middle Ages are by modern bars and restaurants in front of the well liked pebble beaches. Vico has established its own style in selling pizza by the metre!!! Ristorante and Pizzeria Da Gigino on Via Nicotera is the cradle of pizza by the metre. The place is also known as the University of the Pizza and makes miles of delightful pizza daily served with a variety of toppings. BY CAR: the SS145 coastal road goes past Vico Equense. 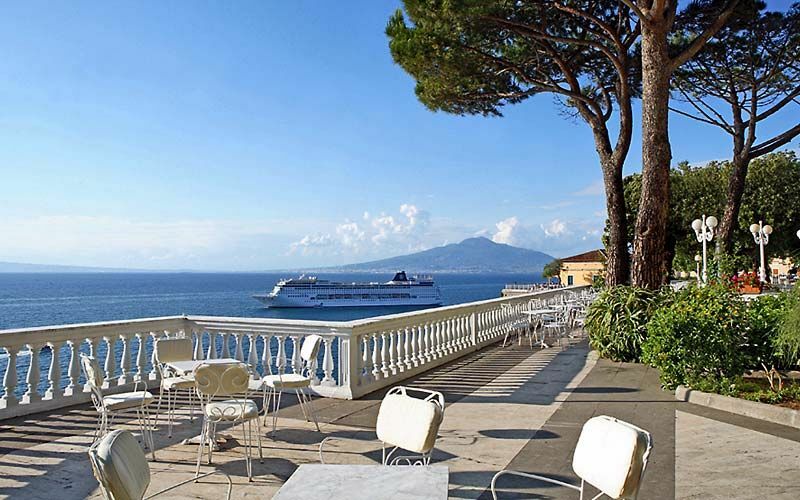 BY TRAIN: the Circumvesuviana train also serves Vico which is five stops away from Sorrento.